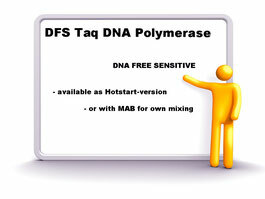 DFS-Plus Taq DNA Polymerase provides a new formula in buffers and additives to prevent failures in PCR-applications were inhibitors (e.g. proteins, fat or PS) reduce the performance. 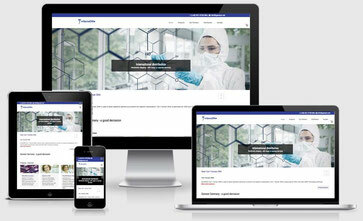 The robust enzyme is well suited for sensitive experiments using random primers or bacterial templates. Because of the high sensitivity less than 6 molecules can be detected. Same as for conventionally purified Taq-DNA Polymerase. 5 units/μl supplied in 10 mM KPO4 (pH 7.4 at 25°C), 0.1 mM EDTA, 0.1% Tween 20, 0.1% Triton-X 100 and 50 % (v/v) glycerol. One unit is defined as the amount of enzyme required to incorporate 10 nmoles of dNTP into acid-insoluble material in 30 min at 74°C. Storage: at –20 °C is recommended to safeguard against growth of bacteria that may be introduced during handling. 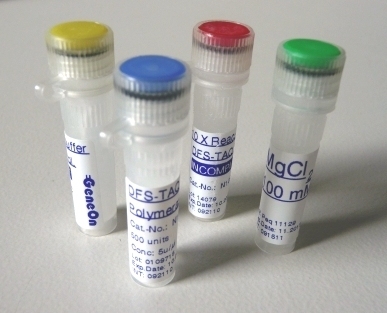 at 65°C in 50 μl yields no detectable degradation of DNA. 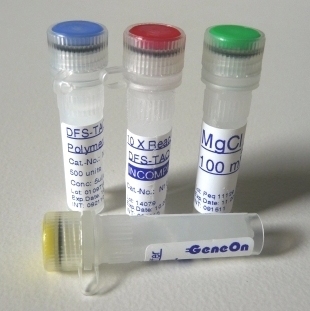 for 16 h at 65°C in 50 μl yields no detectable degradation of DNA. placenta DNA as template (amplified fragment 3.0 kb). Dear customer, GeneON likes to send free samples to convince the valued customer about the quality. Please understand that the shipping costs may be very high to some destinations. That is the reason why we cannot assure to fulfil all sample requests. Sorry for that, please understand. You may also set an inquiry/order directly by e-mail . - Endonucleases Incubation of 20 units of the enzyme in 1x reaction buffer with 1 μg lambda DNA for 16 h at 65°C in 50 μl yields no detectable degradation of DNA. - Incubation of 20 units of the enzyme in 1x reaction buffer with 1 μg lambda DNA EcoR I/Hind III fragments for 16 h at 65°C in 50 μl yields no detectable degradation of DNA. - Incubation of 32 units of the enzyme in 1x reaction buffer with 1 μg supercoiled pUC18 DNA for 16 h at 70°C in 50 μl resulted in no relaxation. - Priming activity Incubation of 40 units of the enzyme in 1x reaction buffer with 100 ng template DNA and 0.2 mM dNTPs each, but without primers in 100 μl resulted in no DNA synthesis.